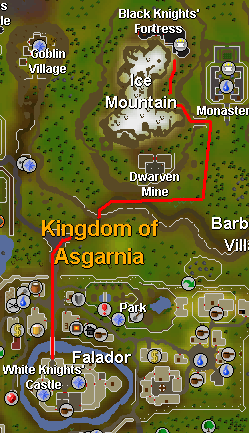 If you are looking for the modern RuneScape guide for this content, please see our Black Knights' Fortress guide. The Black Knights are up to no good. You are hired by the White Knights to spy on them and uncover their evil scheme. 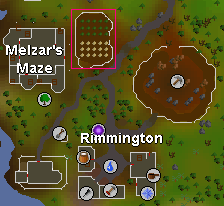 Begin by talking to Sir Amik Varze, located in Falador Castle, about a quest. 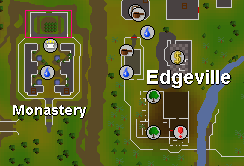 A Bronze Medium Helmet can be obtained through the Smithing skill by smithing 1 bronze bar with a smithing level of 3. You can also buy these from Peska in the Barbarian Village for the price of 24 coins. An Iron Chainmail can be made from 3 iron bars at level 26 smithing. 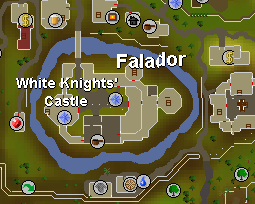 You can also buy one from Wayne in Falador for the price of 210 coins. Head up the ladder in the eastern room and you will find yourself on the 3rd floor again, behind the obstructive boxes from earlier. Head down the ladder that is just next to you. This room is a safe haven. The black knights can not get to you, and you can recharge your prayer. If you are low on life you can wait here until some of it regenerates. When you have recovered, exit the room by the door to the west. A Black Knight will be very hospitable and greet you with a fierce: "Die intruder!!!" And will attack you no matter what your level. 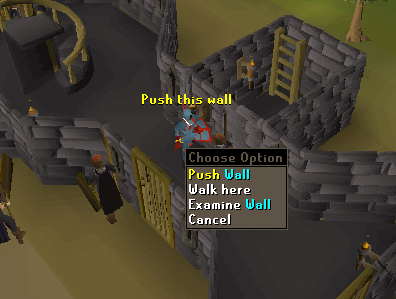 You do not need to kill him, just run past and down the ladder. You will now be on the bottom floor again, run along the corridor and 'listen at grill'. 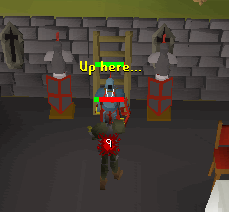 Tell the guard that you'll go in anyway and run away from the Black Knights and up the ladder to the north. Inside here, use your cabbage with the hole in the floor. Warning: Be very careful that you use the cabbage with the hole, because if you do not right-click you will eat it! The witch will throw a fit. Now you can leave to go get your reward from Sir Amik Varze. 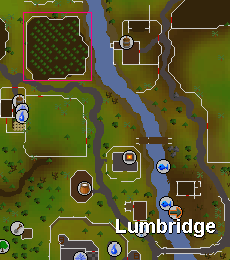 To get out you can back-track to the entrance and walk to Falador, or you can homeport and walk there from Lumbridge. 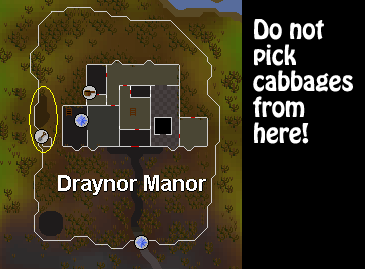 Gather the required items: Bronze Med Helm, Iron Chainbody, and a Cabbage not picked from Draynor Manor. 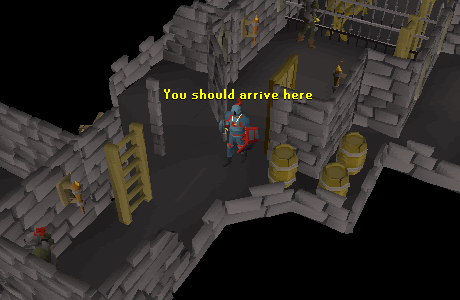 Talk to Sir Amik Varze in the White Knights' Castle. Travel to the Black Knights' Fortress. 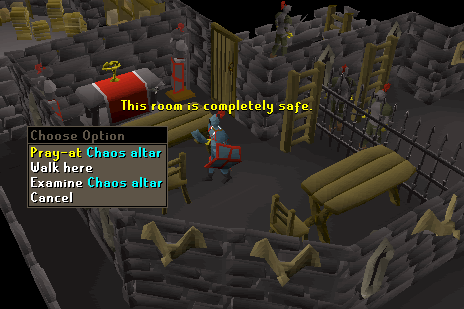 Equip your Bronze Med Helm and Iron Chainbody. Enter the Sturdy Door of the fortress. 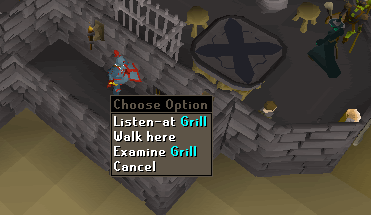 Traverse the Black Knights' Fortress until you reach a grill. 'Listen-at' the grill to overhear the Witch talk about a potion. 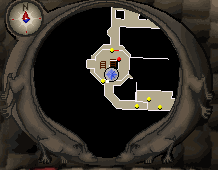 Traverse the Black Knights' Fortress again to find a Hole. Use your Cabbage with the Hole to drop it into the potion. Speak to Sir Amik Varze once again to deliver the news and collect your reward.